http://acecharityafrica.org run a library and a clinic at the Mariri Orphanage & Boarding School in Kano, Nigeria, for 100 boys aged 3-14 orphaned by Boko Haram. 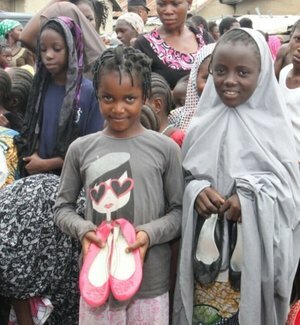 Following our second in-country Sal's Shoes collection in Abuja, Nigeria at http://www.bonhotels.com/protea-hotel-abuja in August 2016, 166 pairs of shoes were distributed by http://thewantedchildrenfoundation.org (TWCF) at their children's home in Abia State. TWCF was established in 2006 to meet the growing numbers of orphans and vulnerable children in Nigeria, and seeks to provide long term safety, security and love to the children accepted into its life-cycle approach program by providing them with a loving home environment, food/shelter/clothing, education, medical care, and psychosocial support/counselling. All 15 children currently living at the TWCF home in Abia State were invited to the 'shoe store' where they could try on and choose their own weather-appropriate shoes to cover the rainy season and dry season in Nigeria. The remainder of the shoes were distributed amongst children in need in the surrounding villages. Following our second in-country collection at http://www.bonhotels.com/protea-hotel-abuja, Sal's Shoes found their new feet in some of the rural villages in Abia State, Nigeria in August 2016. Shoes were distributed by The Wanted Children Foundation (TWCF). Working in collaboration with The Angel Projects (Angels@Work) in July 2017, Sal's Shoes collected at private schools in Lagos, found their new feet at two schools in Taraba State thanks to http://www.developmentafrica.be. Thanks to The Angel Projects (Angels@Work), in July 2017 Sal's Shoes collected in private schools in Lagos found their new feet amongst the young inhabitants of Makoko - a slum neighbourhood [known locally as the floating village] in Lagos. Working in collaboration with The Angel Projects (Angels@Work), in July 2017 Sal's Shoes collected at private schools in Lagos, found their new feet at two schools in Taraba State thanks to http://www.developmentafrica.be. https://dinnoedhjaelp.dk - an orphanage in Akwa Ibom state for children and teenagers. Thanks to https://www.thewantedchildrenfoundation.org every single pair of donated Sal’s Shoes has now found their new feet in the southeast of Nigeria, in the northern part of Abia State.